Be more cute and attractive for the special party time with this cat ear headband! This headband set includes 12 color styles and each color for 2 pieces, all 24 pieces in one pack. Get the set that you also can share them with your friends for it has some elasticity can easily fit with most people. Wide applications: Not only can use for party time, also can use in night event, for costume cosplay. Would be a nice accessory for taking photos. This UNOMOR product is sold with a one-year full money-back guarantee. If you're dissatisfied with your purchase for any reason, contact us for a replacement or refund. 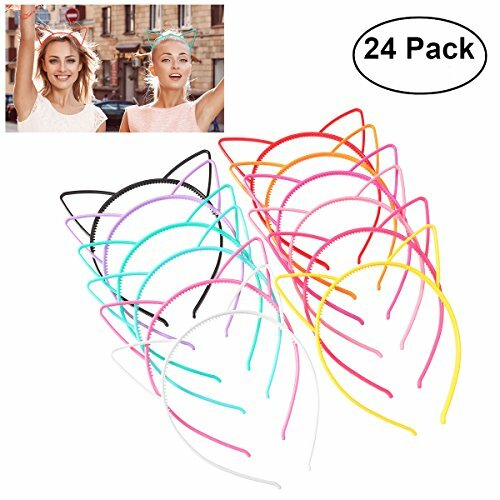 Cute and colorful headband with cat ear. 24 pieces in one pack, one color for 2 pieces include yellow, red, purple, orange, pink, cherry red, dark green, light green, bright red and dark red, black and white. Multiple choice and be more attractive in special time. Plastic cat bow headband. The cat bow headband set has nice elasticity for high quality plastic made. Easily to fit with most people's head. Smooth surface with row of teeth. Smooth surface that comfortable for touching and wearing .The row of teeth that help the headband fit with your hair well, won't slip off. Multi-application. Perfect to use for party, events, dance recital, costume cosplay, you can also use them for taking photos during traveling or dating. NO RISK PURCHASE; full one-year money-back guarantee. If you're unsatisfied with this item for any reason, we'll immediately send you a replacement or refund your purchase price. If you have any questions about this product by Unomor, contact us by completing and submitting the form below. If you are looking for a specif part number, please include it with your message.